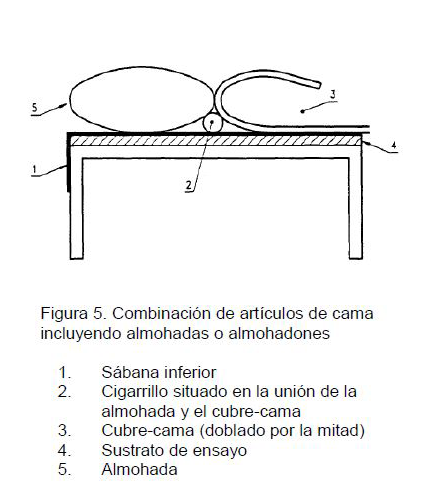 This rule specifies the method to evaluate ignition easiness through the action of a burning cigarette in bedding articles and the placement of the test pieces in every kind of article. 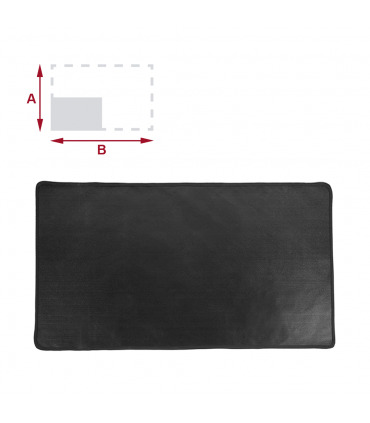 These articles are: matress covers, folded fitted sheets, sheets and wetting duffels, sheets, blankets, electrical blankets, duvets and quilts, pillows and cushions (whatever the filling) and pillowcases. This regulation does not include matresses, bed bases and matress duffels. Any test piece where burning intensifies until a point where the test gets dangerous to the need to reccur to voluntary extinction. Any test piece burning without flame and consumes almost entirely. Any test piece making smoke, heat or incandescence in considerable ammounts, after 1 hour after the cigarette's application. Any test piece that puts in evidence a latent fire during the inspection after the test and an annormal coloration of more than 50mm in every direction. Progressive ignition with flame: presence of a flace produced by a burning cigarette. The test piece is put over the substrate which simmulates the matress (filled with mineral wool fiber with a termical conductivity of 0,04W/m.K.) 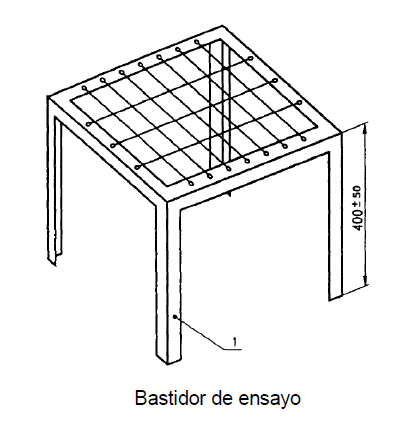 placed in the frame (figure 1). 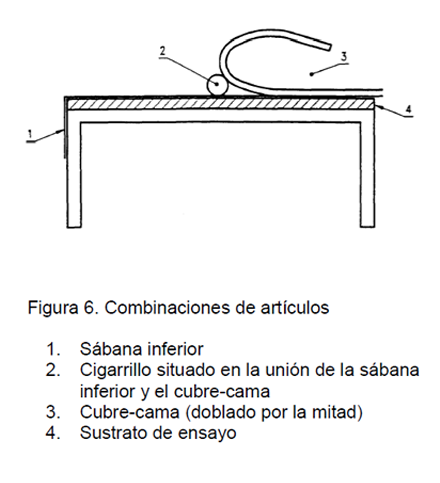 The cigarette is turned on until live incandescent burning of the edge (a cigarette without filter with a length of 70 mm ± 4 mm a diameter of 8 mm ± 0,5 mm and a combustion speed of 12 min/50mm ± 3). 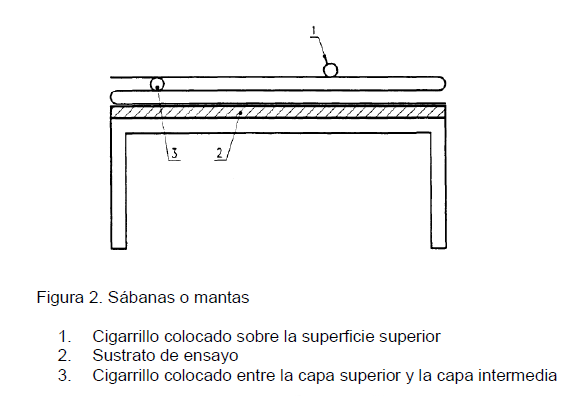 Two cigarettes are placed with a minimum separation of 100mm as it is shown in figures from 2 to 6, depending on the type of article tested, and the cronometer is turned on when the last cigarette is placed. The test piece is observed in order to see if it presents signs of progressive ignition without flame (latent fire) or ignition by burning. In the case that any of those kinds of ignition occur (latent fire or burning), the test piece is extinguished, and the end time and the reason of it are listed. 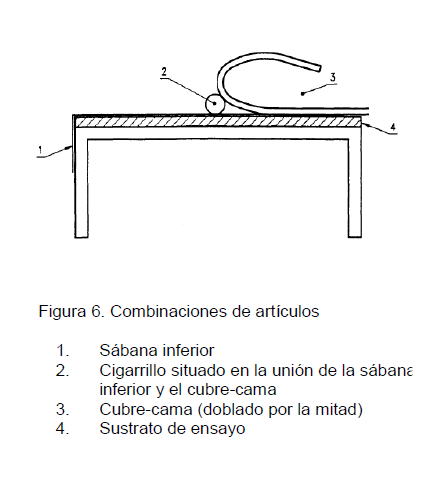 In the case of an incomplete burning of a cigarette, it will be replace by another placing in a non-damaged point by the test at 100 mm of any of the other cigarettes and the cronometer is turned on again. If with this second cigarette it happens again, the absence of ignition is listed and the test is interrupted. Easiness of ignition of the bedding article. Articles identification and all its components. Result of the test; ignition or non ignition. Number and date of the regulation. Performance of the test piece after the previous cleaning treatment if required. All pertinent observations regarding fire performance. 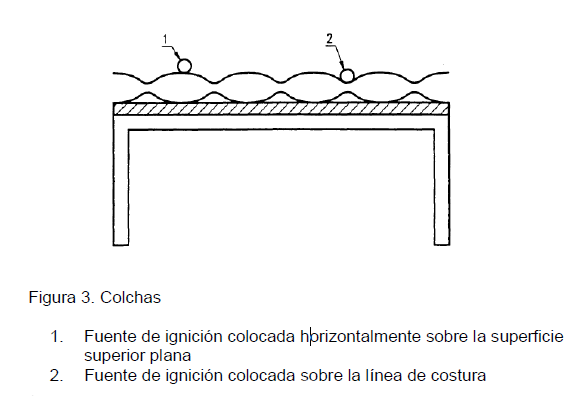 This regulation specifies the method to evaluate the easiness of ignition through the action of a uncovered small flame (match) of bedding articles and the placement of the test pieces for each type of article. 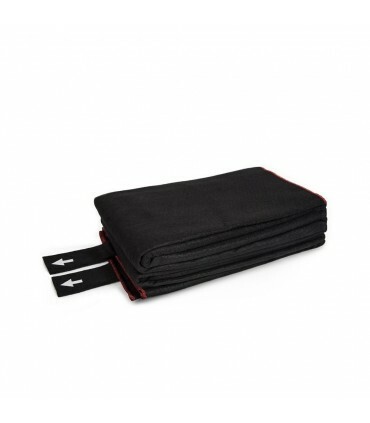 These articles are: matress covers, folded fitted sheets, sheets and wetting duffels, sheets, blankets, electrical blankets, duvets and quilts, pillows and cushions (whatever the filling) and pillowcases. This regulation does not include matresses, bed bases and matress duffels. Any test piece making smoke, heat or incandescence in considerable ammounts, after 15 minutes after the ignition source. 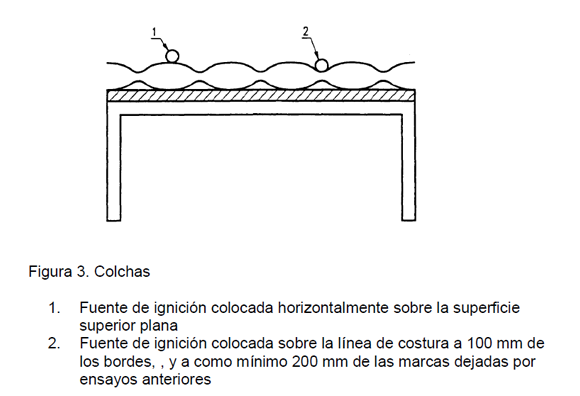 Any test piece that puts in evidence a latent fire during the inspection after the test and an annormal coloration of more than 100 mm horizontally from the closest point to the ignition source. a) Any test tube which, during the test, is getting worse in a way that is dangerous to continue with the test and it needs to be finished. b) Any burning that persists more than 120 s after retiring the source of heat. 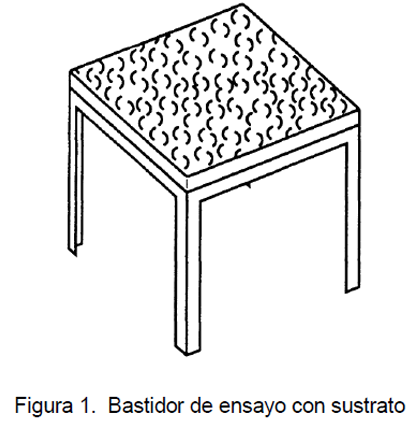 The test tube is place over the substrate (filled with mineral wool fiber with a termical conductivity of 0,04 W/m.K.) 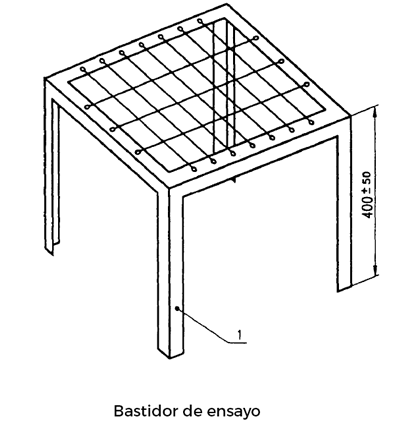 placed in the frame (figure 1) as it is shown further on depending on the kind of bedding which is going to be tested. The ignition source is turned on (propane gas flame with a nominal pressure of 2,8 kPa), adjusting the flow to 7.3 and it is allowed to stabilize duting 120s minimum. 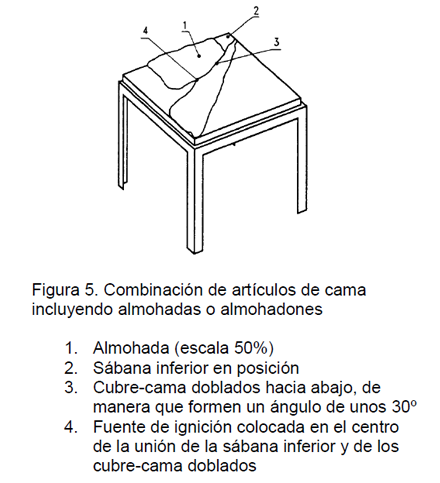 The ignition source is placed in the position specified in figures 2 to 6 and is left in this position after 15 seconds. The test piece is observed in order to see if it presents signs of progressive ignition or burning. 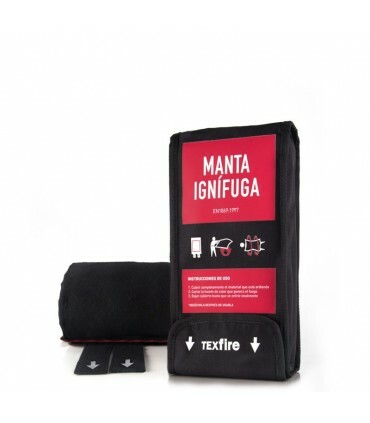 In the case of any of these kinds of ignition is produced (latent fire or burning), the test piece is extinguished, and the end time and the reason of it are listed. 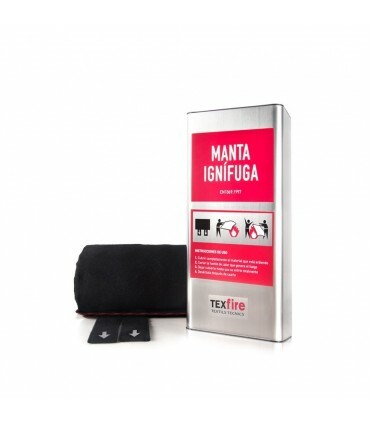 In the case of not observing an ignition by burning, the test is repeated putting the flame in a new position. If the test piece is not destroyed very much, the test could be repeated with the same, placing the ignition source at 200 mm, minimum, from the last position used. Article identification and all its components. All pertinent observation regarding fire's performance. Results classification UNE-EN 14533 for tests according to UNE-EN-ISO 12952 Regulation. - CLASS A: test of easiness of ignition with a burning cigarette and test of easiness of ignition by an uncovered small flame are both passed. - CLASS B: test of easiness of ignition with a burning cigarete is passed only. 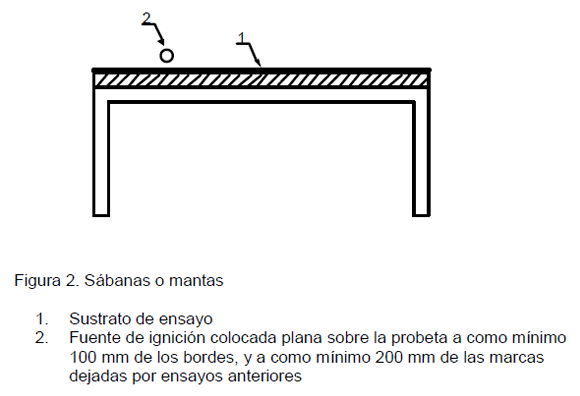 - CLASS C: test of easiness of ignition with a burning cigarette and test of easiness of ignition by an uncovered small flame are both failed.